There are many ways to become involved at FCW. One way is to make a donation. FCW is in the process of expanding it operations and is in need of financial resources to meet the needs of the neighborhood. To fully equip the shop, FCW needs an additional $1500 beyond the United Way grant we recently received. Tools and infrastructure are expensive, but a co-op's effectiveness lies in its completeness and organization. If the shop lacks either characteristic, it won't be good for anybody. If you would like to help us construct and equip our shop, please send a check to Franklinton CycleWorks at our shop address. FCW also depends on donated bicycles. These bicycles are an invaluable resource at the shop and will be used in either our earn a bike program for the homeless and working poor, or for sale to supplement shop expenses. We also appreciate the donation of bike helmets, locks, lights and any other bike component or accessory you may want to donate. We hope to make these much needed accessories available to those who can not normally afford them. By volunteering, people will earn store credit which can be traded in for anything in the shop. The goal is to provide the means by which people can comfortably and safely ride their bike at any time, in basically any condition. 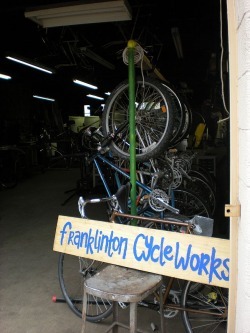 If you would like to make a donation or organize a "bike drive," please contact JY at jy@franklintoncycleworks.com. And of course, we could always use your donated time. Consider becoming a Co-Op volunteer at FCW after being trained in bike repair. Or participate in one of our community event nights to lend a hand with a particular project.